KIEV, Ukraine -- A survey taken on both sides of the Eastern Ukraine frontline has surprised researchers in Berlin. A reflection of the complex conflict landscape, the results contain messages for both Kiev and Moscow. Professor Gwendolyn Sasse of the Centre for East European and International Studies. The critical phase of the war in Eastern Ukraine began around three years ago, in June 2014. The previously restrained Ukrainian army attempted to expel the Russian-led armed separatists. This was only partly successful. The frontline that resulted from the conflict that summer, which split the coal-mining area of Donbass into two parts, is still mostly in place today. Kiev controls more than half of the areas of Donetsk and Luhansk; the rest is part of the so-called "Donetsk People's Republic" or DPR/DNR. What do people who live in these regions today think about the background to the conflict? Where do they see their future? The recently founded Centre for East European and International Studies (ZOiS) in Berlin went in search of the answers to these questions, talking to people on both sides of the frontline. The ZOiS took an uncommon approach since most of the Ukrainian opinion researchers only talk to people on the Kiev controlled side of the Donbass. This has happened due to security reasons and perhaps also because of the idea that those living in the "People's Republic" would be too fearful to always tell the truth. The Berlin researchers were also aware of the risk of bias. 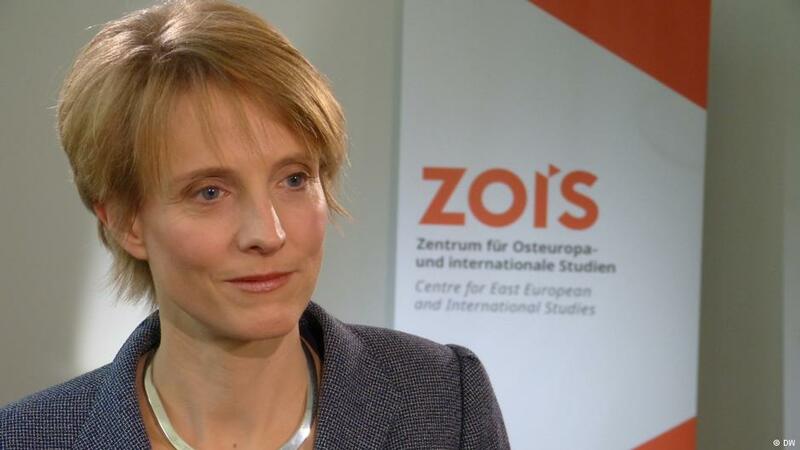 "No survey conducted in a war is going to be done under ideal circumstances," ZOiS director Gwendolyn Sasse tells DW. On the Kiev side, the survey was conducted in person and in the occupied areas it was done over the phone. "I think a telephone survey has certain advantages, because people feel more secure," says Sasse. The drawback is that some questions have to be shortened. Overall, at the end of 2016 around 1,200 Eastern Ukrainians were surveyed. The results have shown that there are differences but no deep divisions in the thoughts of people living on the two sides. "In many aspects we found more similarities than one would have been able to guess from a Western perspective," says Sasse. Around one third of respondents maintained contact one to two times per week with relatives on the respective other side. On both sides there is a mix of Russian and Ukrainian identities. However, one result of the war is that when compared to citizens on the Kiev side, people living in the "People's Republic" feel more Russian (26.1 versus 3.4 percent). Conversely, one in five respondents living in Donbass - west of the dividing line - report that in the last three years their Ukrainian identity has been strengthened. Further to the east, in the separatist area, this result was only 8.5 percent. In terms of foreign policy priorities, people in East Ukraine have been against Western integration for years. This has barely changed, according to the ZOiS survey. A large majority, around three-quarters, is against Ukraine joining the EU and NATO, long-term goals which Kiev has been striving towards. However, the proportion of those who are for these goals is significantly higher on the Kiev side. On the question of joining the EU, for example, the difference between the sides is 27.9 percent to 18.2 percent. Both sides were united in having a majority who hold a critical opinion of Ukrainian President Petro Poroshenko. On certain issues, however, the ZOiS researchers have found significant differences. Almost half of the inhabitants of the "People's Republic" consider "Western interference" to be the cause of the war. About one third of the population perceives the war to be a "local reaction against the nationalist government." On the side, under Kiev's control, 23.1 percent hold this opinion. Significantly more people (37.1 percent) blame Russia here. The attitude towards the Minsk agreements, which would provide for an extensive autonomy of the separatist regions, differs widely. About 40 percent of Ukrainians in the areas that are under Kiev's control would "tend to agree" to these agreements. Only half as many share this view in the separatist regions. The issue of the future status of the separatist areas shows a particularly stark contrast in views. A clear majority of those living on the side that is controlled by Kiev (64.7 percent) wants a restoration of the pre-war status, as opposed to less than ten percent of those living on the other side. About one third of the population on either side would prefer autonomy within Ukraine or Russia respectively. When it comes to the question of its status, the Donbass region is "really divided," believes Sasse. According to her, this is an important message both to the people involved in the conflict and for those who are engaged in conflict resolution. On the whole the Berlin-based expert recommends the Ukrainian government "not to give up the occupied areas too easily". Yet Sasse warns that "on the other hand, Moscow should not assume that a further integration of the occupied areas will go smoothly", not least because "views and identities of the people there differ vastly, and many have not given up being part of Ukraine."